Update: This article has been updated with a new video interview with Synative from Pocket Gamer Connects London 2019. 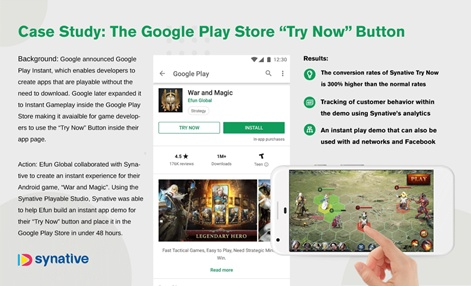 In an effort to tackle the mobile discovery issue and create an easier way for consumers to quickly test games, Google Play has rolled out instant 'Try Now' demos across the store. Here, developers working with an ad tech firm partnered with Google Play can build quick 'playable' demos that can be played in an instant without the need for a download. One company that has just partnered with the Android marketplace is Synative. Developers can use its Playable Studio to create these demos and playable advertisements for Facebook and mobile ad networks. Not just a platform that offers a quick method of building quality demos, Synative's tech also features analytics so developers can see how users are interacting with their playables. Such feedback means teams can use real user data to refine the experience and generate more installs. To find out more about the tech we spoke with Synative senior overseas marketing manager Luke Stapley. The Synative team will be at Pocket Gamer Connects London on January 21st to 22nd. Could you tell us about your Synative Try Now tech and how it works? Developers can create a playable ad using the Synative Playable Studio. Once it's built, we can work with them to make the required items Google needs so that they can have the playable placed in the store as the 'Try Now' button. More technical information can be shared with developers if they would like. The whole process can take 48 hours, but more likely 72 hours. So they can have it built and ready for the game's next update. How quickly can a demo be built with the tool and do you have any best practices for effect demos? The demo can be built in under 60 minutes depending on the complexity of the branching and looping in the demo. Most demos built by our team only require 30 to 45 minutes after the assets are fully prepared. Asset prep (videos, audio, images, gifs, etcetera) varies between marketing groups. Prep is due to Google and ad network requirements for ad size, so shrinking everything takes some time. Why is it important to have tracking enabled for how users interact with the demo? Two big reasons. One is finding out where the bottlenecks are and where gamers are leaving the demo. This allows the developer to plan out better strategies for their next demos or find where gamers are making the decision. This helps you find the players that are more likely to enjoy your game now and lead to longer retention rates. We found some developers may add too many actions for a demo or make it too tedious. So it's important to know everything that is happening to discover how the next demo will play out. The other big reason is that it helps in A/B testing of options they choose in the demo. Our system allows for branching choices, like a 'Choose Your Own Adventure' book. Knowing which options users like and which lead to installs will lead to better demos not only for the Google Play Store, but also for future campaigns on Facebook or the ad networks that we support. What does your partnership with Google mean for developers you work with? For their customers, with the number of games already on the store, this gives you even more ways to disassociate yourself from the rest of the apps and give the consumer a quick look at the game without a need to wait for the download to end. For the developers, this also helps you find the players that are more likely to enjoy your game now and lead to longer retention rates that always lead to improved chances they will become a paying user. We have seen from Machine Zone that it takes a long time for many consumers to want to make in-app purchases, so if they love the game and play it longer, it will then lead to more spending than with an interstitial ad or video that only shows the player gameplay, not be a part of it. What makes your tech different from other ad tech companies partnering with Google? We are the only ones that allow developers to build it all themselves, allowing their marketing teams' full power on how to share the vision of the game compared to the weeks of planning you may need with other companies, or results that have nothing resembling your gameplay or vision. We want developers to have all the power and just be the tool to drive them towards the people ready for the next best game. What noticeable impact do 'Try Now' demos have on games? Any stats you can share? Here is our case study for the Try Now button that we've made for Pocket Gamer Connects London. As well as playable demos, what other services do you offer developers? We only do playable video demos, but we have services to help them such as a team of highly qualified content producers that can build assets for the game or commercials for them, but this is for an extra charge. We also have some services that are in beta that we'll be announcing at GDC later this year, so we hope to share them with you as well later in the year or discuss them with you at PGC for prep before GDC. Find out more about Synative on the company website or during Pocket Gamer Connects London on January 21st to 22nd. Hi Marius, Luke from Synative. I'm not quite sure why you would get a 404 as we were able to demo the game from the show floor of the Pocket Gamer Connects event. I'll contact you directly so we can give you a personal example and find out what was happening on your end. But if there is an issue, we'll be quick to take care of it. Went to google store, typed in War and Magic, clicked the TRY NOW Button. Page 404 Not Found loaded. Marius, please have "Instant Apps" for Google Play enabled. All technology using the Try Now that us as well as competitors are using take advantage of it. Please follow this link to enable for older phones. This seems to be standard for those using the Android P operating system. Hi Luke, thanks for following up.